Item numberDS405 - Leo - Image © Digital Sky LLC. This inkjet print is 16 " by 20" in size, printed on quality photo paper. Ready for mounting or framing. Leo is an impressive and easily recognized constellation that dominates the spring sky in the northern hemisphere. 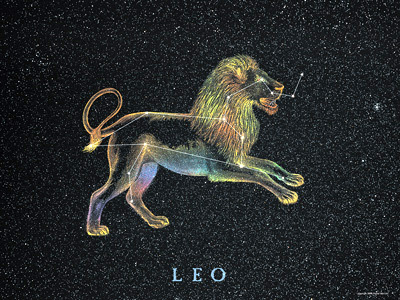 Leo is characterized by the asterism of the backward question mark which defines the head and mane of the lion. The brightest star in Leo is Regulus, at the base of the backward question mark. There are many beautiful galaxies found in Leo with a modest size telescope. Look for M65, M66, M95, M96, among others.